After rolling office chairs became a standard in our homes and office spaces, the need for chair mats increased dramatically. Why would you need a chair mat anyway? Well, first off all, most flooring manufacturers won’t give you a warranty unless you use a chair mat. Rolling office chairs can significantly damage carpets and floors. Also, it is much easier to roll your chair on a mat than on a carpet. Apart from avoiding back and leg pain, you can avoid injuries as well – the chances for leg strains or injuries caused by falling down from the chair are much lower if you use a chair mat. In this guide, we will talk about a bamboo chair mat, which is becoming increasingly popular nowadays, and for a good reason. What Is a Bamboo Chair Mat? 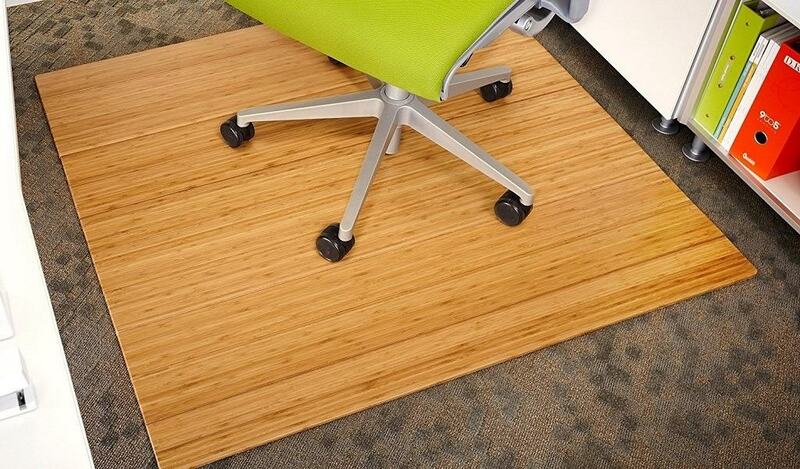 Bamboo chair mat is a mat built to accommodate any surface. It can be used both on carpets and hardwood floors. It is a natural, elegant solution for all the problems posed by rolling office chairs. They are usually made from a bamboo plank and they come in all shapes and sizes, which is another important thing you must consider before buying a chair mat. You can buy a smaller mat, with 43”x48” dimensions with no lip, or 44”x52” with a lip, all the way to the 55”x57” with a lip. When it comes to colors, natural bamboo color is similar to beech wood. It can be darker, similar to oak. For a desired, darker color, bamboo has to go through a carbonizing process of steaming under controlled conditions. You may find other colors, which are usually similar to the portable dance floors colors. 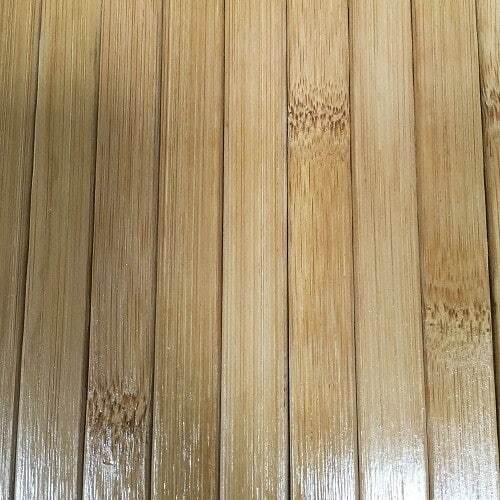 The mat made of bamboo will usually have much better noise absorption than other mats and it is more durable than the mats made from other materials. This is especially important for offices – you don’t want to make noise and disturb your colleagues, and you certainly don’t want to damage office floors or carpets. However, if your floor is already damaged, you should think about replacing it, instead of trying to mask the damage with a mat. If you are looking for other types of flooring besides wood, you may want to consider if interlocking carpet tiles are a better choice for you. Another important, yet pretty unknown feature of bamboo chair mat is its strength. Bamboo has a tensile strength of 28 thousand square inch, which is 5000 more than a steal. It is one of the strongest materials known when it comes to tension structure. Therefore, if you pay a little bit more for a bamboo chair mat, that will be the most cost-effective way to invest in the long term. 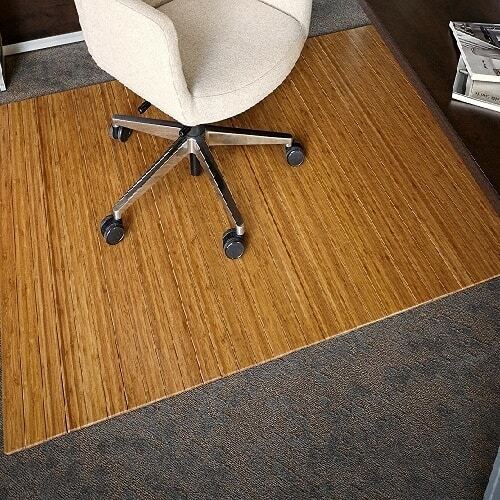 Bamboo chair mat will last longer and provide better protection to your floors and carpets. 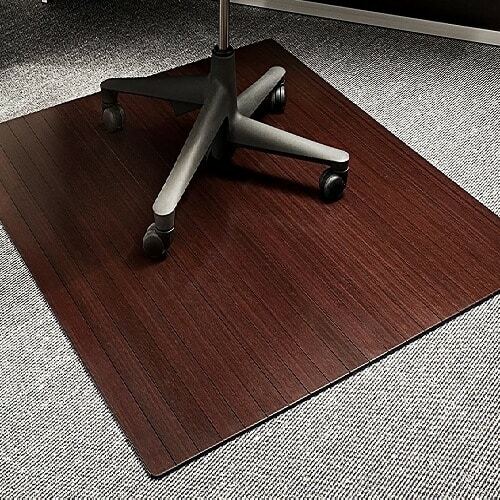 With an elegant finish and nice coloring, bamboo chair mat is the best choice for office spaces. Rolling office chairs will tear up carpets and damage floors faster in workspaces than at home. Employees will have to roll faster, stand up more often and in most cases won’t handle the things in the office with as much care as they would do at their home. 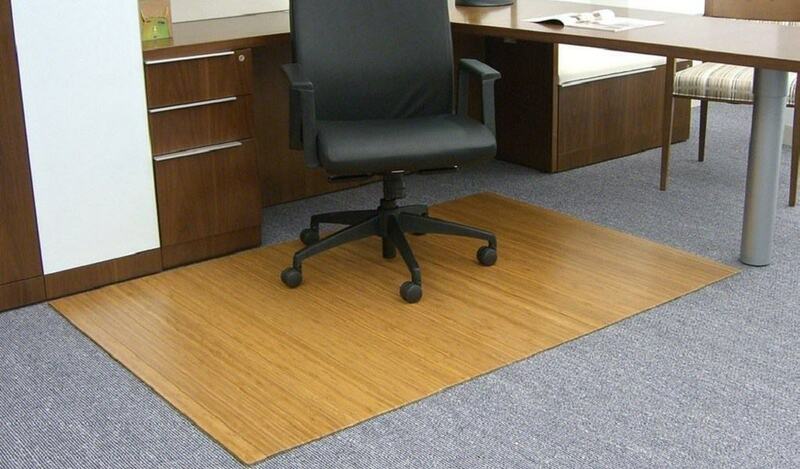 Bamboo chair mat is an excellent solution for offices because it is more durable, more stylish and more functional than other chair mats. Most of the bamboo chair mats you will find will be laminated. Lamination improves physical features of the material. It is a process of manufacturing a material by applying heat, pressure, welding or adhesives. After this process, bamboo becomes even more durable and gives a better protection for floors and carpets. The cleaning of these mats is similar to cleaning bamboo and hardwood floors. You should vacuum or at least sweep your bamboo chair mat regularly. Don’t use a wet mop, since standing water may cause a damage to the mat. Also, avoid using cleaning products, especially abrasive cleaning soaps. When thinking about buying a chair mat, most people will eventually opt for a plastic chair mat, instead of buying a bamboo chair mat. Plastic mats have a significantly lower price tag, they are less visible and easier to maintain than bamboo mats. However, there are several reasons why bamboo chair mat is a much better option than a plastic mat, especially for offices. 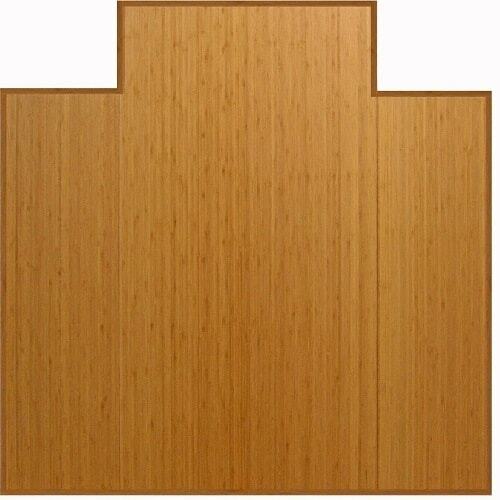 Bamboo chair mats are more durable than plastic chair mats. They won’t crack under the weight of a rolling office chair, but a plastic mat surely will over time. Bamboo chair mat is more attractive and elegant than a plastic chair mat. It can even be used as a part of an office decor theme. It creates a richer environment and can add a “wow effect” when a new worker is introduced to the collective. Most of the bamboo mats can be easily rolled up, and you can clean the floor underneath them without too much effort. The difference between a standard and roll up bamboo chair mat is significant. Roll up mats are becoming increasingly popular, because they can be set aside easily to save space, especially in offices. Also, the cleaning of roll-up mats is easier, so it is clear why they are more popular than standard mats. Now that you know the advantages of bamboo chair mats, let’s review the top five bamboo chair mats that are currently on the market to help you decide which mat is the best to suit your needs. Anji Mountain bamboo chair mat, with a price tag under $100 for a 42 x 48-inch mat, is one of the best selling products in the category. The reason behind its success is simple – it looks elegant, the finishes are impeccable and you will get the most for your money. This is a 100% bamboo chair mat, and it comes in three colors – natural, dark cherry, and walnut. You can clean this mat with a damp cloth and water, but make sure that the mat is 100% dry after you finish the cleaning. Bona Pro Series hardwood floor cleaner and a refresher is also recommended by the manufacturer. Another bamboo chair mat from Anji Mountain is a little bit bigger (44 x 52 inch). When it comes to coloring, dark cherry and natural are available. This mat is ideal for Berber or Loop carpet and hard floors as well. We advise using hard floor chair casters. The product can be cleaned with mop and water, and Bona Pro Series hardwood floor cleaner is also recommended. Since this mat is slightly bigger, it is better for office spaces, especially if rolling is required on a daily basis. This bamboo mat cannot be used as a chair mat. It is too small and not that durable as other presented mats. This product is available only in brown color (but it is similar to natural), it can be rolled up and it is a great protection for a bathroom and kitchen floors. This mat can have one more unlikely purpose – it can serve as a dog pad! If your dog is mostly outside, you should buy a quality kennel plastic flooring for its cage. 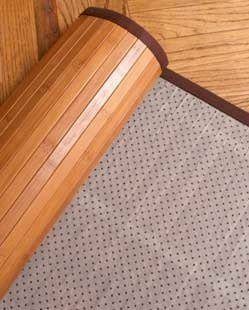 Pillowtex bamboo mat is great protection for your carpets and hardwood floors. We don’t advise you to use it as a chair mat since it is not that durable. It is available in natural and espresso colors. Pillowtex bamboo mat has a non-sleep backing which will prevent the mat sliding. This mat is very resistant to coffee and other liquid spills. It is environmentally friendly and best to use in kitchens, bathroom or a living room. Above all this, you will get a three-year warranty from manufacturing defects. This is a bamboo chair mat that costs over $100, but its price tag is justified. It is available in natural and dark cherry colors, and apart from 36x 48 with a lip which are standard dimensions, you can get six additional dimensions from the manufacturer. The mat was heated in a kiln oven to the ideal moisture content, so it is extremely durable. Also, UV-cured coating prevents fading caused by sunlight. 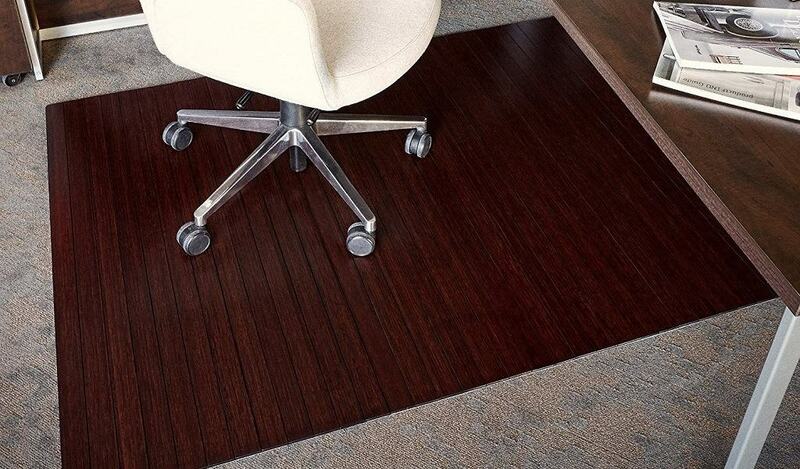 Anji Mountain dark cherry bamboo chair mat is the best choice both for office spaces and your home. At a first glance, the price is too high, but if you decide to buy it, you will get the most for your money. If you don’t have the money for a high-end bamboo chair mat, but you want to add the charm of bamboo to your home, we recommend buying a cheap 3 x 5 inches bamboo mat for your kitchen or bathroom.